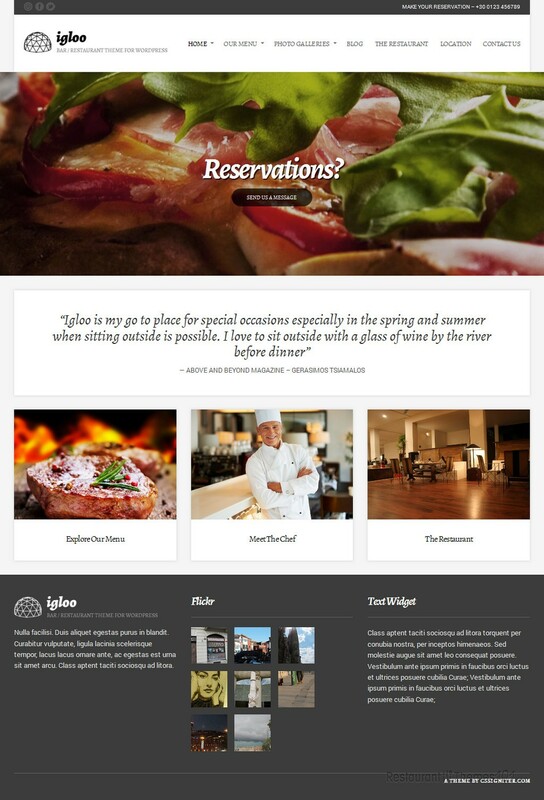 Igloo is a responsive restaurant theme for WordPress developed by CSSIgniter. This is a truly amazing looking theme with many great features. Promoting your content and placing the most important thing in the spotlight is what Igloo is all about. Its simple design will make sure your customer’s attention is pointed in the right direction. Your content will be in the spotlight and all the great services you provide for your customers. The colors prevailing in this theme are gray and white, making the whole website look fresh and clean. Enhanced by a full width slider, your homepage will look spectacular. You can place quality photos in this slider and grab everyone’s attention with them, and you can also link these photos to various posts from your website. By clicking them, your visitors will be taken to the right page, whether they choose to check out your location, make a reservation, or to take a look at your menu. Setting up the according photos and links will make everything easy for them to find. 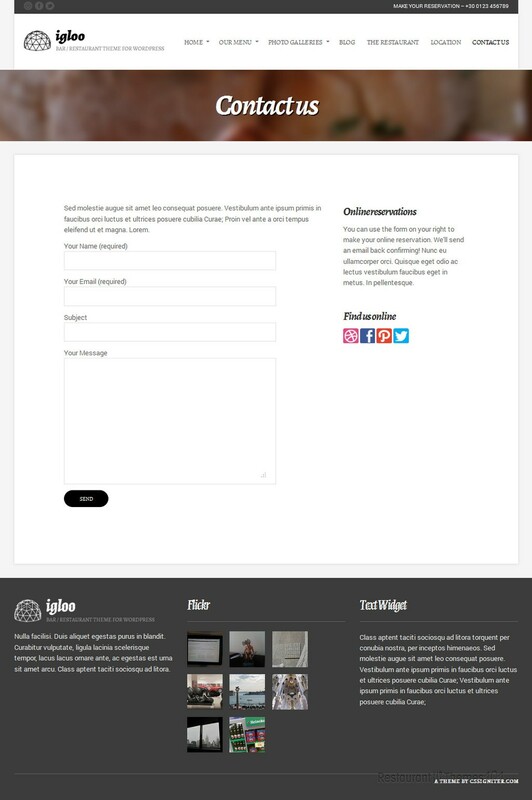 Testimonials from existing customers that praise your restaurant are always a nice addition to any website, and Igloo allows you to present them in a nice, eye catching way. Have a bunch of nice praise taking place right in the middle of your website and let everyone see what a great service you provide. 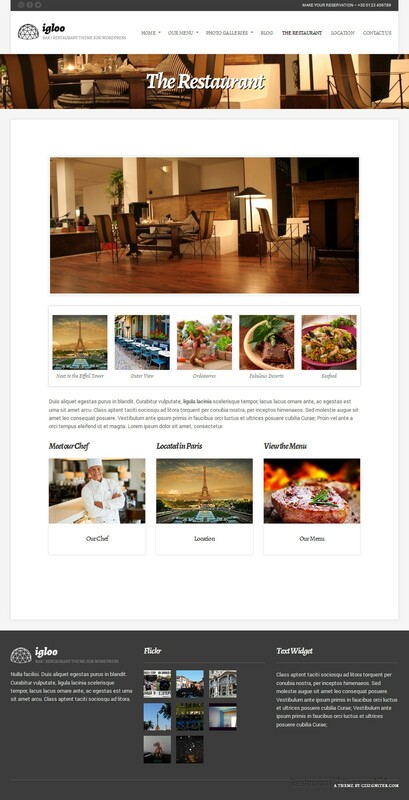 You will also be able to present your chef in a separate post, and feature it on the homepage with a resized photo so everyone can click and get to meet the person who prepares all those delicious meals. Featuring various content on your homepage is possible and easy, no matter if it’s your menu you want to present or your restaurant and it’s pleasant ambient. 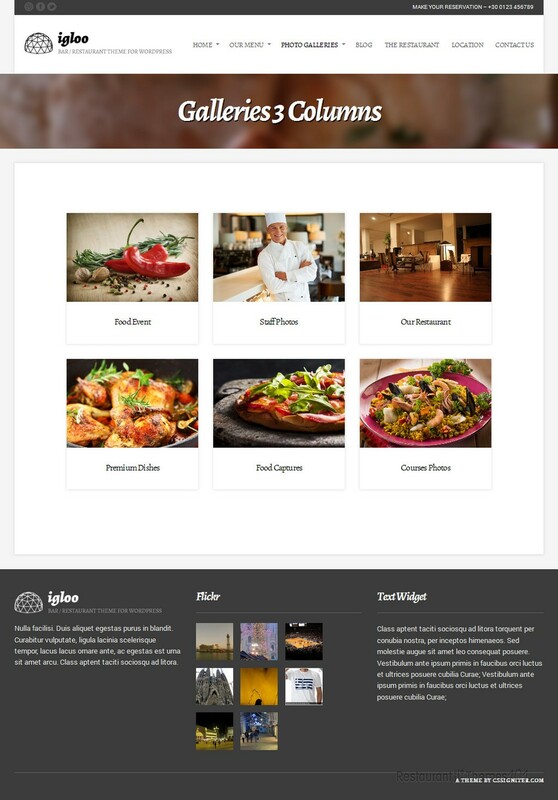 Igloo is a responsive WordPress restaurant theme, which means your website will look perfect no matter what screen size or resolution it is seen from. 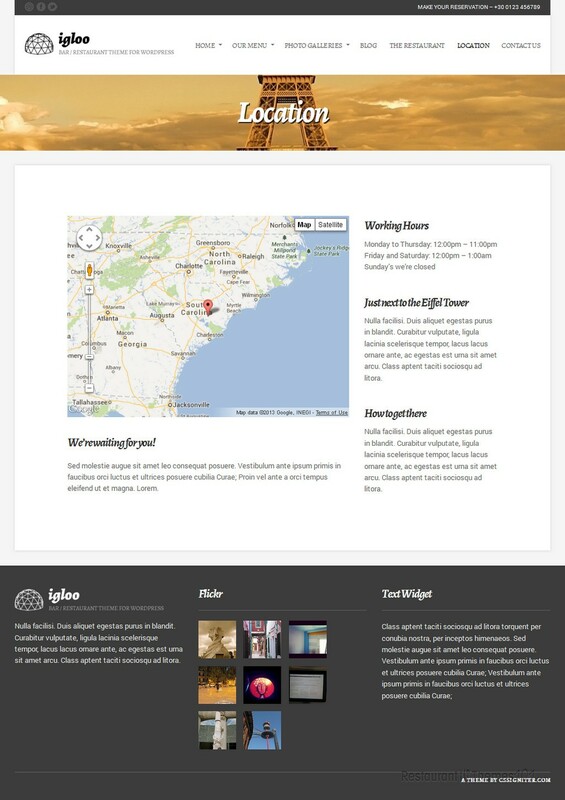 This theme features nice social integration allowing you to connect to popular social networks, and in addition, there is a Flickr widget for showing your Flickr gallery on your website.